A new medical device which hit the market last weekend is already flying off the shelves of virtual stores. Shitbit helps you evacuate your bowels so frequently and so heavily as a strategy to lose weight through defecation. The device has the ability to release an odor that tricks the customer's brain into going to the bathroom, even if they don't need to. Some have been skeptical before buying into the new technology, but the results have been incredible. 1.2 million customers have lost an average of 24 pounds in the first 3 days of wearing the device on their wrists. Sarah Ordure, President and CEO of Shitbit, was more positive during this morning's conference call compared to last quarter when she dropped a turd on investors surprising them with financial results that essentially hit the fan. The stock had fallen 22%, but has recouped most of the loss during the past week. "I am highly confident that we can push out great numbers in the upcoming months," Ordure stated. "Shitbit has had a blowout first week with over over 1 million devices sold." 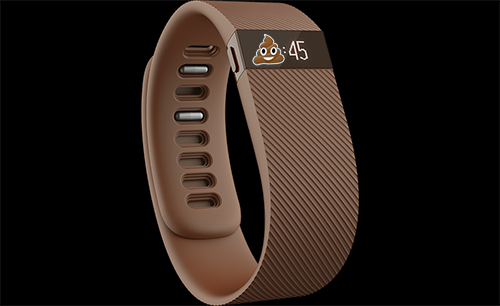 Shitbit's leading-edge Odormeter uses advanced Scentsors to track and predict bowel movements. The device also makes recommendations to change people's diets in order to help them lose weight. The Future Post had the opportunity to interview Guano Cowpat, a local social worker who has lost an astounding 45 pounds in just four days on Shitbit. "Prunes have been my number one food recommendation for 32 hours sequentially. That's all I eat!" The company intends to disrupt the industry by releasing a version that can be worn around the waist like a belt. In the overall weight loss industry, Shitbit is number two in market share, only lagging to juggernaut incumbent, StoolPool.